Mass Polymers takes great pride in introducing itself as a prominent name in the industry of Plastic Extrusion Profiles. We are a reputed Manufacturer, Supplier and Exporter of a wide range of Plastic Products. 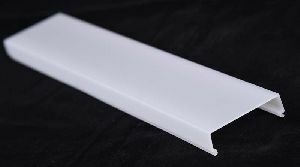 We bring forth Plastic Extrusion Profiles, Polycarbonate Diffuser and Plastic Beadings. We are driven by excellence with a mission to grow and achieve the elite status in this industry.